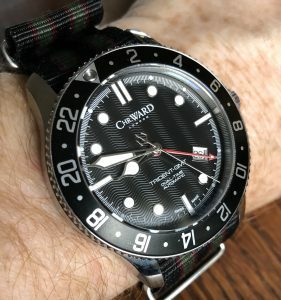 For some reason I have steered slightly clear of Christopher Ward as a brand, I have not warmed completely to them. I think this might be because their positioning is based on a very commercial message, great value well made watches. I think I might have been doing them a disservice especially when you consider some of their recent launches. Over the Christmas holidays I had the chance to see one of their watches for a little longer than the cursory trial at a show. 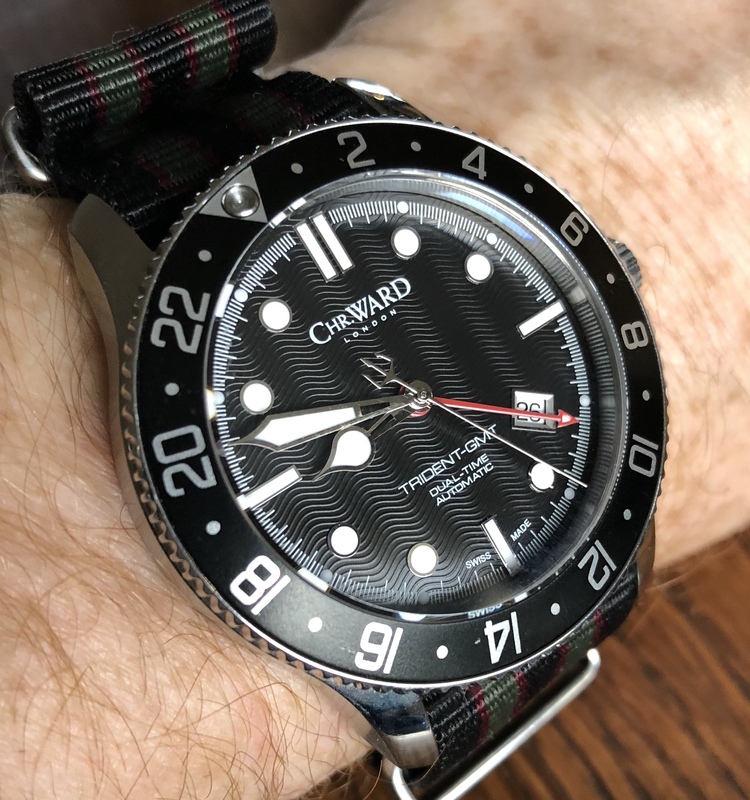 My brother turned up with a Trident GMT on a “Bond” nato strap. Although this model is one of the many “homage” to the Rolex Submariner, hence the Bond strap, it does have enough design details that make it a little more individual. For starters the case is 42mm. Then there is the trident shaped second hand and the textured ( I am sure there is a technical description) finish on the dial. The final obvious difference on this watch is the red second time zone hand. Adding to the charm of this particular watch is the steel bezel and the old style Chr. Ward logo. My brother tells me he bought this watch a few years ago in the sale, duty free, so paid well below the £700 plus of the current model. For this he has a well made GMT tool watch which he says he uses when visiting “dodgy” countries, were his more normal wrist wear might attract the wrong sort of attention. Maybe I should start checking eBay. Due to the usual real life commitments common at this time of year I have had little chance to think of anything in particular to feature this week. 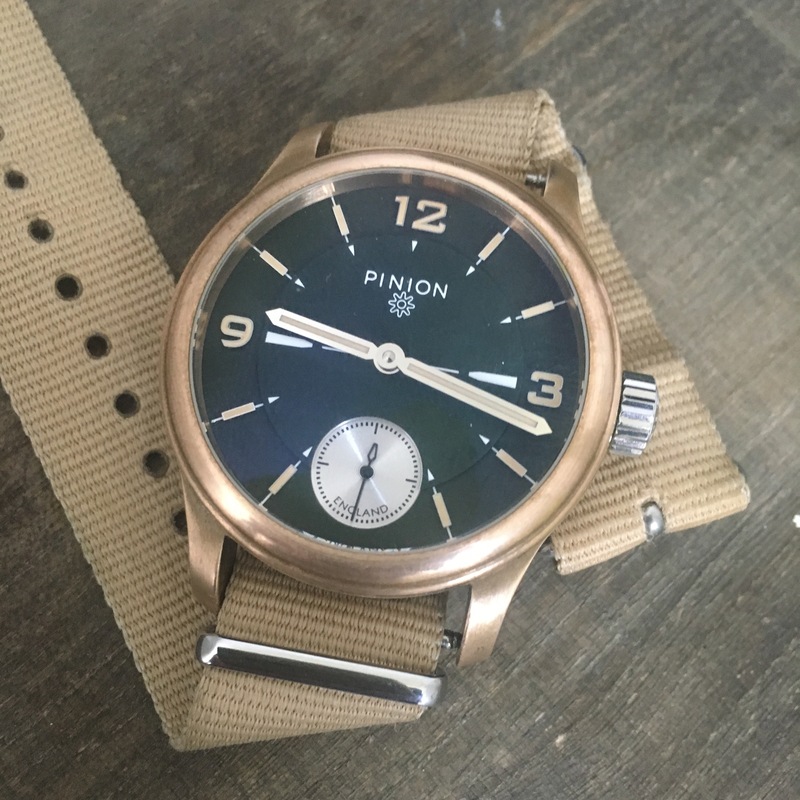 There are however two pieces of news I think is definitely worth mentioning appeared in the latest Pinion newsletter. Firstly, the original Pure range has come to an end but the new model line will feature vintage hand-wound movements in smaller cased watches. In the same newsletter Piers also announces Pinions’s return to bronze watches with a revamped Axis II. I am wondering now if these two announcements could be combined into a slightly smaller bronze cased hand wound Pure ?